The HV supply feeding three water pumping station which are absolutely essential for the operation of the mine, were suffering severe damage due to lightning discharging onto the HV lines or poles. The massive over - voltage destroyed the HV insulators causing line failure. This means that the mine would go off line for at least 24 hours for the repairs to be undertaken only to have the same problem occur during the next storm. An initial solution of an earth catenary wire was installed a number of years earlier with the intention of intercepting the lightning strike. Unfortunately this catenary wire solution was unsuccessful. In 2008 LDU was approached by the mine to investigate and propose a solution to the problem. The major problem was that the HV lines extended in 3 directions for kilometers, and we could not install a system on each and every pole. Therefore our consulting company, LDU Consultants Pty Ltd, conducted a statistical analysis of all the damage to the feeds for the past 10 years to discover a number of hot spots which indicated the common paths for lightning storms. Next we developed a plan and designed a trial which saw us install 14 systems consisting of a Prevectron S6.60 terminal and a HV Surge protection for each phase, on the 14 poles, as shown in the photos above. The terminals were selected to protect not only the pole, but the cables in between the two poles where possible. Since the installation completion in 2008, LDU has not received any reports of damage to the areas we protected. This means that the excessive downtime experienced by the mine were reduced considerably if not totally, saving millions of dollars of lost productivity. The Lithgow Correction Facility was established over 15 years ago as the flagship in modern technically advanced correctional facilities. This prison was to be the forerunner in new designs for state penitentiaries. It had state of the art monitoring and security facilities to enable a better and more efficient method in the operation of state correctional facilities. Within the first few years the NSW Correctional Services discovered that the location for the facility was not appropriate as the facility was located in a valley at the foot of an escarpment and was constantly bombarded with severe electrical storms causing havoc with the technology resulting in tens of thousands of dollars worth of damage each year. In 2004 LDU was approached by the Department of Corrections to investigate and propose a solution to the problem. LDU designed a system incorporating an umbrella of Prevectron Lightning Protection terminals to totally cover the entire facility combined with high quality surge protection to protect all the very sensitive technology throughout the facility. Since the installation completion in 2005, the Lithgow Correctional Facility has not suffered any damage from lightning even though the first storm they experienced after the installation was one of the most severe they had on record. The department has saved millions of dollars they would have spent on repairing damage. To date LDU have installed systems in 6 other correctional facilities with similar results. Whitsunday Apartments is a resort hotel located on Hamilton Islany. The exisiting lightning protection system installed on the building suffered a fatal failure. The system was a very old EF system which had a mast failure. The mast was a FRP mast with guy wires. The system was well and truelly past its use by date. 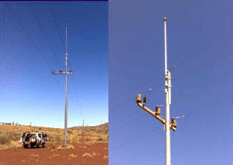 A PREVECTRON TS25 ESEAT terminal was installed, mounted on a 5 meter high tensile, marine grade spun aluminium mast rated for 69 m/p/s wind speed (Cyclone rated), located on the lift overrun. The lightning Rod stood tall and straight throughout the cyclone, not a problem with it. The waterproofing around it tore off but the mounting was fine. The Metal sheeting around the lift shaft where the Lightning Rod is ripped off but the Rod stood tall. So in the end it did really well. The system stood proud in full operational condition while the rest of the roof suffered damage.